In this article we are going to share very useful and important Chemistry GK Objective questions in Hindi. All questions is very important for those candidates who want to crack various national and state level competitive exam such as Teacher recruitment test, CTET, TET, NEET, JEE Main, CET, University Engineering entrance exam, Medical exam and board / school level exam. 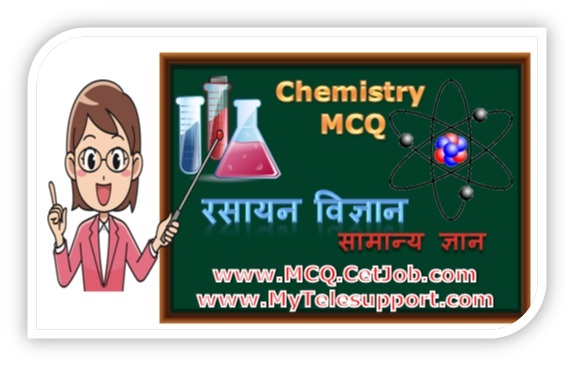 All Chemistry GK MCQ set having ~100 MCQ which is asked in previous year exams. रसायन विज्ञान सामान्य ज्ञान सम्बंधित बहुविकल्पीय प्रश्नोत्तरी में लगभग १०० प्रश्न दिए जा रहे है जो कि उन विद्यार्थियों के लिएबहुत ही महत्वपूर्ण है जो प्रतियोगी परीक्षाओ, या बोर्ड परीक्षा की तैयारी कर रहे है.